A story about life in London that is far different from that of staunch traditional formality, cucumber sandwiches, and the Royals, was published in the March 4 edition of The New York Times Magazine. The article delivered an engaging, up-close-and-personal view in words and pictures of life in the city for new arrivals – a stunning 2.6 million over the last decade. 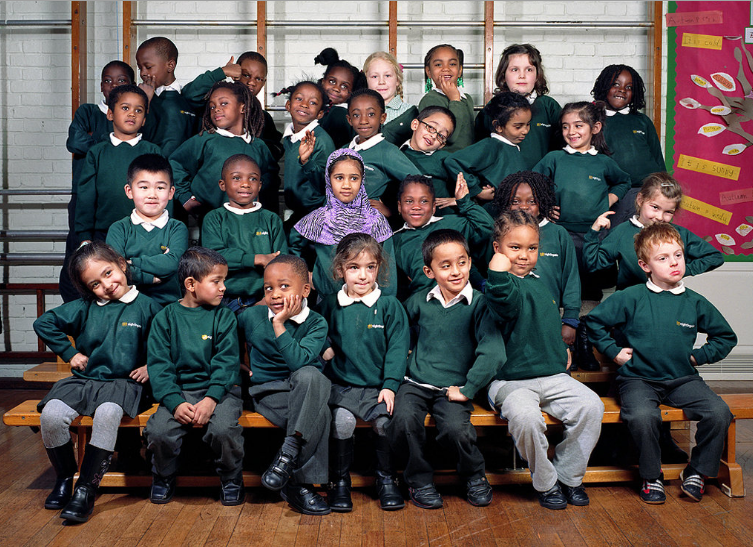 This photograph in particular caught my eye, of students at Nightingale Primary School. Love it! And Mr. Man—first row, third from the left? He’s my favorite! Click here for the article and more wonderful visuals. I just wrote an extra-long comment! this really spoke to me today. thank you so much for blogging it!! I am so happy – thank “you!” Your comment rings so true!